Made in rural villages in India using centuries old handloom techniques, Indigo Handloom brings together an ancient art form with bold contemporary designs. It was a gift to a friend. She loves it, and her friend wanted one like it. I bought this as a gift for my daughter-in-law and she loved it! San Francisco based Indigo Handloom is a company devoted to preserving the craft of handmade scarves and textiles in India. Founded by former journalist Smita Paul, she became interested in the world of handlooming while researching the fabric trade in rural areas. Indigo Handloom's scarves combine traditional Indian weaving methods with a modern, Western aesthetic. The beauty of these scarves lies in the gorgeous hand-dyed and crafted materials and in the fact that they support a fading industry--socially, economically and environmentally. Indigo Handloom creates jobs for local artisans and fairly treats and compensates them for their skills and expertise (the average worker can support a family of eight). Emissions are very low impact, as no electricity or other energy sources are used to produce the goods. 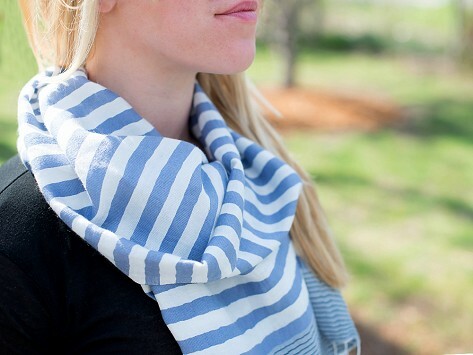 The soft 100% cotton Calypso scarves are made for those who wear them and for those who wove them too.